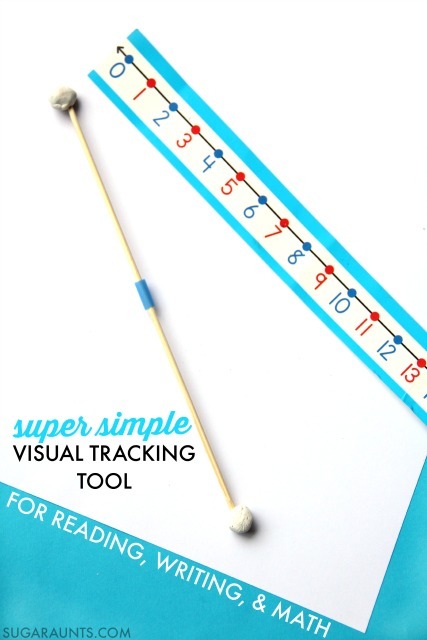 This Visual Tracking tool is super easy to make and fun to play with, making it a great way to work on visual tracking skills. We shared an easy way to practice visual tracking with bottle caps not too long ago, and this visual tracking tool will be another creative way for you to work on visual tracking abilities in handwriting, reading, and math number line use. We explained a lot about what visual tracking means here. Visual pursuits are often referred to as visual tracking. When an object moves across a person's field of vision, their eye movements maintain fixation. Visual tracking occurs when a persons's eye's move along a line in a smooth and accurate manner. When a person moves their eyes, there are two types of eye movements that they use to gather information. 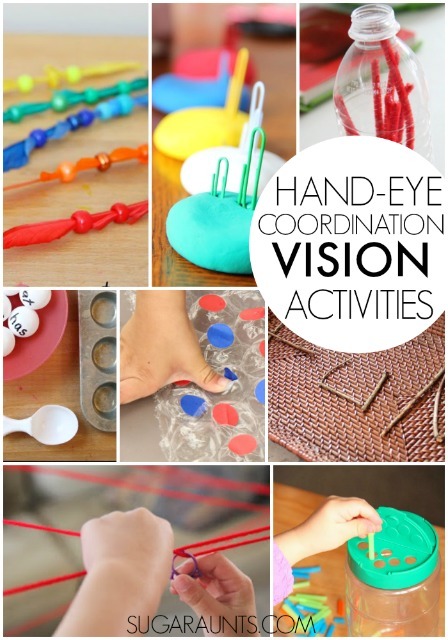 Visual pursuits (tracking) and saccadic eye movements (scanning). Visual tracking can occur with just the eyes moving or the eyes and head in a combined manner. Visual tracking depends a lot on visual attention and fatigue. Here is more detailed information on saccades and how they impact learning. Must use finger to keep their place when reading or when copying a line of text. Skips lines or words often when reading and copying in handwriting. Moves head excessively when reading. Using this easy tracking tool requires coordinated movements of both hands together, in coordination with the eyes. integrated movements of both arms and crossing midline is important for laterality and directionality. These are areas needed in writing and reading letters and numbers without reversals. This visual tracking tool is a great way to practice smooth pursuits of a brightly colored object as it moves in a line across a visual field. Cut a small piece from the straw. Thread it onto the skewer. Roll a ball of clay and press it onto both ends of the skewer. Done! You can allow the clay to harden, or use it as is. 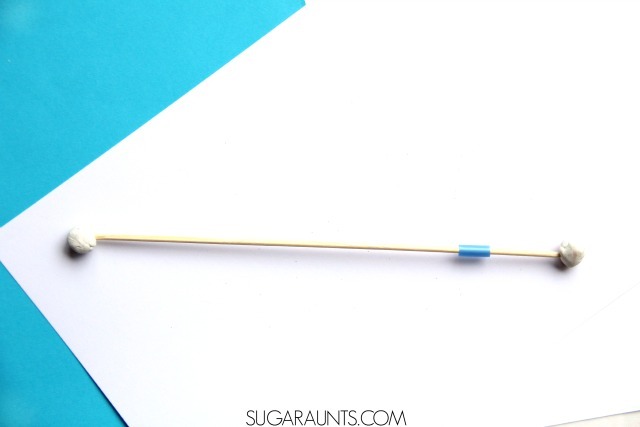 Practice smooth visual pursuit by tilting the skewer from side to side and asking your child to follow the straw with their eyes. 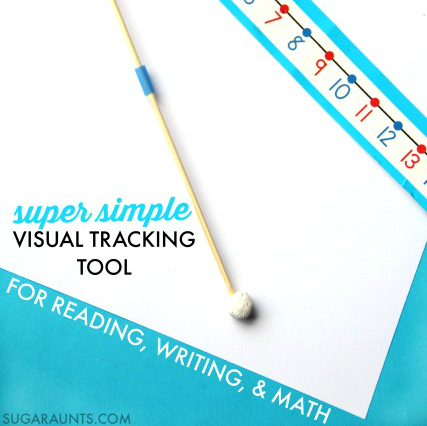 Allow your child to use the tracking tool and ask them to follow the straw with their eyes. Use the tracking tool in math by placing it along a number line. 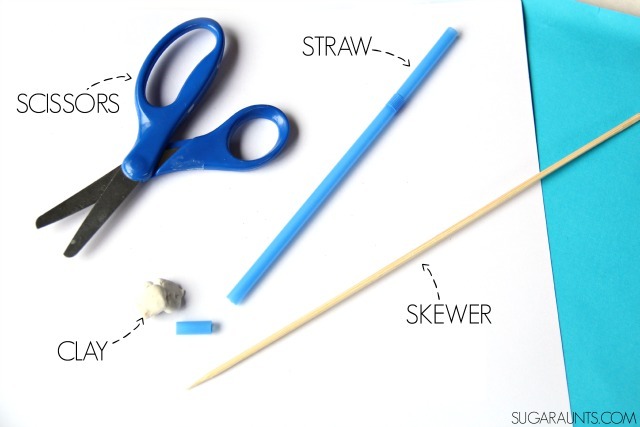 Tilt the skewer from side to side and when the straw stops at a number, ask your child to name the number. You can extend this activity by asking them to add or subtract numbers that the straw stops at. Align the tracking tool under a number line and use the straw as a movable placeholder while the child counts out addition and subtraction problems on the number line. Use the tracking tool in reading by placing the skewer under a line of text. 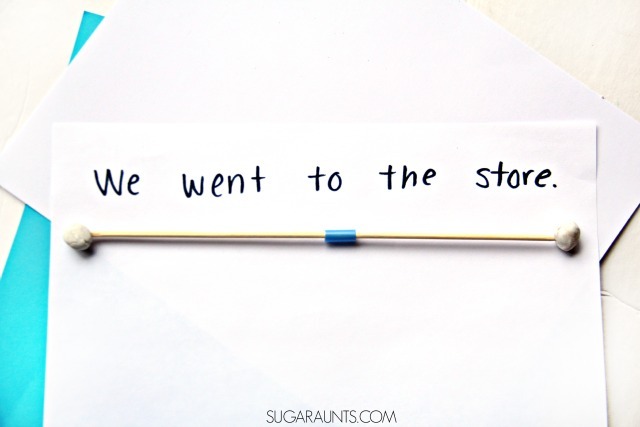 Move the straw along the length of the skewer as the child reads the words in the sentence. Hold the skewer up horizontally in front of the child. Ask them to look quickly from one clay ball to the other. You can use different colored clay for each end and say "red" for red clay and "blue" for blue clay as they shift their eyes from the red end to the blue end. Then, hold the skewer vertically and ask your child to quickly look from the top ball to the bottom ball. Finally, hold the skewer in a diagonal position and ask them to quickly look from one ball to the other. Be sure to sign up to receive our newsletter so you don't miss a post. Sign up here.